How can it be the end of the first month of 2015 already? Yet here we are, participating in the last Weekly Photo Challenge of January. 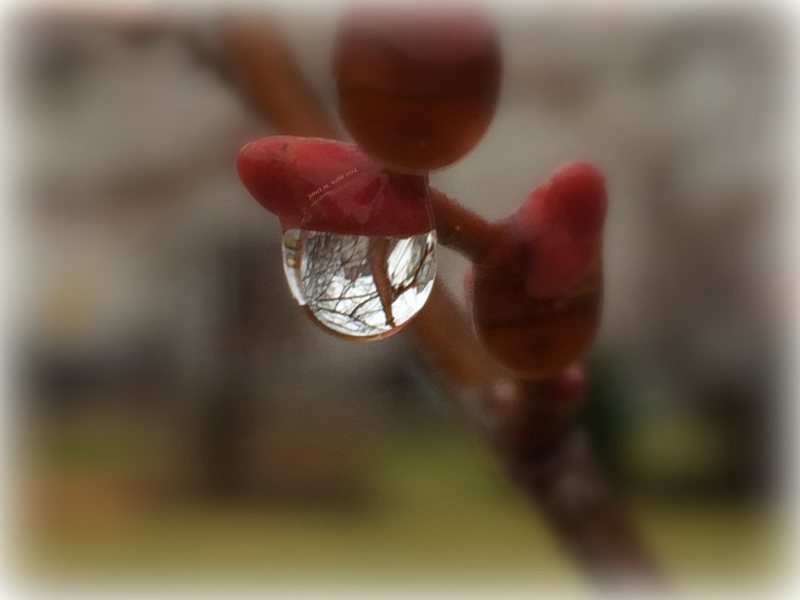 The theme this week is “Depth.” I love the depth seen in the drop of rain in the photo I’m sharing and of course, that meant adjusting the depth of field as well. I hope your January has been wonderful and that February is even better. Awwww, thanks very much! That compliment is greatly appreciated. Hope you’re all feeling good by this time and enjoy the weekend. Thanks very much and for stopping by as well. Enjoy the weekend. It is incredible. I have a similar photo made with a mirrorless camera and see yours is not much different!! Janet, this is incredible. Such depth. Kind of reminds me of a snow globe. Love it! I have a similar dewdrop on a magnolia taken quite a few years ago, and not as sharp!! It took some time, as the iPhone camera doesn’t always want to focus on the little things. It prefers the big background. But persistence won the day. Ahh, Helen, I’ve had to give up before, too. Sometimes it takes me several minutes before I get what I want; sometimes I don’t get it at all. Really clever take on today’s prompt! I think this is my favourite photo today! In this group of photographers, that’s a compliment I treasure, Vernette! Many thanks, Norm, especially for always dropping by. Janet, this is stunning, a world in a drop of water! Andy, nice to see you on this sunny Friday. I have to go out of town shortly, but I look forward to whatever your entry is and am thrilled you like mine. Thank you Janet, I posted a shot featuring some Eastern European snow, and will probably post again on belgianstreets, safe travels! Fab capture, such an interesting way of showing a scene, through the finest reflection in the water, good find! Thanks so much, Laura! I really love trying to capture drops of water but this one added unexpected depths. Oh my!! What an amazing photo. A great reflection of the world beneath. Just AWESOME!! you should submit that shot to a contest ! We’ll have to look for one. My pleasure, Norma. Thanks for enjoying and for letting me know that you did. Have a wonderful weekend. Wish you a wonderful week ahead, Janet. Thanks a lot, Sandra. I’m frustrated right now by people who don’t tag their entries “Weekly Photo Challenge” and then the entry won’t come up in the reader. If I include “Depth”, I get all sorts of other posts as well. Sigh. This is really perfect, Janet! Thanks much, Ese. I really appreciate that. I don’t think my camera will allow me such beautiful shots; glad you can take them for me to see. And it’s taken with my phone. Wow! I know my phone won’t do that! Much appreciated, K.Z. Feel better and enjoy the weekend. I’m just coming off of almost two weeks of being sick. Yuk! Stunning, it took my breath away 😉 How did you get this shot? Just kept touching the screen of my iPhone 5s until it finally focused on the drop and not the background. 🙂 I’m so pleased you loved it! It is absolutely stunning Janet!! It’s my pleasure to be able to share and I’m happy you enjoyed it. Have a wonderful weekend! Izzy, thanks very much and have a marvelous weekend. This is quite beautiful. I think the red of the buds (?) enhance the picture. Hi, Alicia, and thanks very much. Nice to be in contact on FB, too. An exquisite photo, Janet, I love it. Marion, I really appreciate that. I hope you have a great weekend. Wow that’s a stunning shot. Suzanne, I’m happy you like it. It took so long to get in focus and then when I finally looked at it, I was so pleased. Thanks ever so much, Karen. I hope you have something excellent planned for the weekend. A brilliant capture Janet! Wow! Hey, Sam, thanks for traveling over from Switzerland to say hello! So pleased you like my photo. Nature can be so beautiful, can’t it, Karen? It makes my day to read this. Thanks! That is awesome, Janet. One of my favorites! Jan, thanks! I’m pretty happy with the way it turned out, too, and I’ve been waiting to use it. Thanks for coming by the blog. Beautiful, Janet. The world in a drop! I love it! “The world in a drop.” Lovely way to put it, Cathy. I love the details you captured in the drop. It’s beautiful with your depth of field. Thanks, Kitty. I was trilled with the way it turned out. Janet, Beautifully captured. This is a fascinating droplet. I’m so pleased you like it, Jane. It’s a little microcosm of nature. It’s wonderful how the reflection of the tree shines through the clear drop.! It was beautiful and I was happy when I saw that it turned out to be as beautiful in the photo as it was in real life. Thank you, Leya. It does look a bit like a jewel, doesn’t it? Very nice Janet. Amazing you shot it so precisely. It took some doing, Indira, but the result was worth the effort. Beautifully done Janet! I would love to be able to do that someday. Beautiful shot – in so many ways! There’s so much beauty in droplets of water, especially when they reflect the way this one does. Janet this is absolutely spectacular! Did you take it for the challenge or already have it? Amazing. Simply gorgeous! I always wonder how people take these photographs of droplets with images in them?!? Do you use a macro lens? The reflection in the drop is like it’s own little world. I think that’s the coolest thing about it, Joseph. Good capture Janet, like this a lot. Thanks very much. I appreciate it. Wow! So beautiful . . .
I’m glad you like it, Kanlaon. Thanks for visiting. Very nice. I took a bunch of shots like that today, after our big rain. Glad you like it, Mary. No rain here, just Iots of snow! I was considering the purchase of a nice digital camera, but now I may invest in a new cell phone with a good camera function. Dave, both a digital camera and a phone with a good camera are useful, but I find for me at this time, the phone camera is better as I can carry it with me all the time and get lots more shots that way. I have a digital, but only take it out occasionally. Thanks for your visit and comment and all the best with your choice. I’m glad you do, Rob. Thanks for stopping by and commenting as well. The tree was filled with these drops. So amazing. Thanks very much! I appreciate you stopping by. Thanks very much! I think it’s one of my best and I’m amazed that I could catch it with a phone camera. Its so ethereal ! A tiny world . Thanks! That’s exactly what I thought. The photo challenge gets lots of views, Jo, but lots of those people aren’t “friends”, just visitors, which is fine, too. Even most people who follow the blog rarely check in. That’s why I value those of you who do so highly. It’s never too late for a new friend. And yes, there are too many who’ve disappeared.